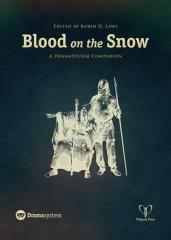 Blood on the Snow further explores the potential flowing from DramaSystem's basic creative tools. DramaSystem MasterClass dives deep into tips, tricks, and techniques to enrich your game, whether you're playing it straight-up, or using it as a springboard for another roleplaying experience. This section provides inspirational exhortations, reverse engineering anecdotes, and step-by-step methods to unblock stumped scene callers. Join our vanguard of early adopters as they analyze the drama token economy, ponder the paradox of low-pressure GMing, hack the scene calling process, and raid the engine for prequel potential. As soon as our crowdfunding backers first checked out DramaSystem in draft form, they saw that it cried out for a live action application. Emily Care Boss brilliantly gets the game off its feet and into the big play space in the DramaSystem LARP Rules chapter. She lays out two distinct modes of play, of varying degrees of Nordicness. From the character-making process to the debrief in the pub afterwards, she's got you covered. Then it's time to once again gorge on the breadth of DramaSystem's applicability with a further cascade of Series Pitches. Our international super-team of contributors spans schools and generations of gaming. Showing off the game's flair for the historical, they take you to 10th century Iceland, the Spanish Reconquista, 30s Shanghai, and the American Civil War. With robot doctors, transhuman transformations, and genetic hegemony, they exploit DramaSystem's suitability for classic, idea-driven SF. Those looking to get crazy will find improbability-powered mecha, Tsarist steampunk, and a war in heaven. Literary inspiration abounds, from the tearooms of Jane Austen's Bath and a revolution against Robert W. Chambers' Yellow Sign, to wizards suffering middle-aged despond as faculty of their magical alma mater. In other words, Blood on the Snow contains more options for play than any one group could ever exhaust. Thank goodness there's a MasterClass entry helping you to pick your next destination for drama, whether you find it in the glossy world of England's equestrian set, the rural grit of a declining town in the American heartland, or a good old fashioned fantasy city chockablock with elves, dwarves, and orcs.